Martin Luther King Jr. and Malcolm X met long enough to exchange a handshake in 1964. 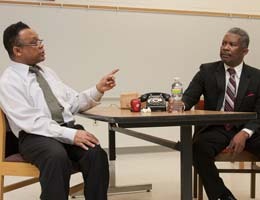 Richmond’s Center for Creative Development presented the production with Tony Cosby starring as King, Calvin Allen as Malcolm X and Ted Moody as Malcolm X’s bodyguard, Rashad. The event was in recognition of Black History Month. “We as a people will get to the promised land,” he says.